I decided I wanted to see the aurora borealis, so I took four days off of work, bought the cheapest plane ticket to Fairbanks I could find, and drove around the state sleeping in the back of a minivan. I picked the time, early September, because it would be late enough in the year to have enough darkness to be able to see the aurora, but not so late that it is too cold to sleep in a van. Also, the moon was down most of the nights I was there. As the time approached, the weather forecast was showing cloudy skies the whole time, so I was a little worried I wouldn’t get to see anything. 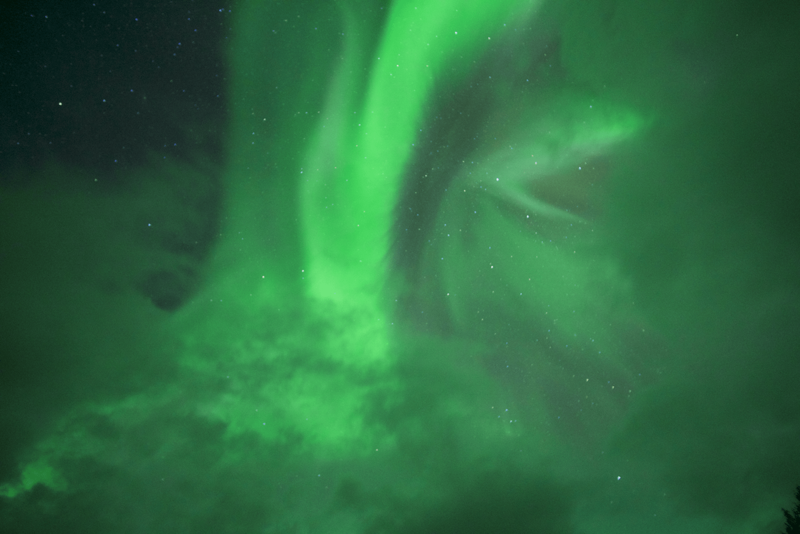 As soon as I stepped out of the airport in Fairbanks at 1am, I looked up and there it was, not terribly bright but reaching all the way across the sky. My first night, just outside Fairbanks. The trick to seeing the aurora, best I can tell, is timing (luck is also a factor, as the brightness depends on how the sun is acting.) I have friends that have spent a month in Alaska and didn’t see it at all. I was there for six nights and saw it five of them. Part of that was the time of year, as I said before, and part was the time of the lunar cycle where the moon wouldn’t be in the sky. The third part is the 1am part. Specifically, being in the middle of nowhere at 1am. At one o’clock in the morning, the sun is pretty much as far away as it can get at that time of year, so it is the darkest it will be. Most nights I just stayed up until about then, hanging out in the van and reading, occasionally peeking out the window to see if there was any activity. Sleeping in the van is the easy way to accomplish this, though a small RV would be just as good (better, maybe, if you’re more than one person and have the $$$). The first time I went, it was just after Labor Day (the last weekend of the tourist season) and I just walked to a rental car counter at the airport and asked for a minivan. I folded the rear seats flat and inflated the air mattress I had brought along. Rolling home away from home. Alaska is very friendly to people just pulling over anywhere and sleeping in their vehicle. Just be careful with your food and trash, because bears, and be sure to dress warm, because Alaska. The next year, I went with my girlfriend and we arrived just before Labor Day expecting the same thing. But, Labor Day weekend is a big tourist weekend there, and all the rental car companies were out of larger vehicles. All but one was out of everything. Luckily, Enterprise had a Subaru Outback, which would have been decent for one person, but was pretty cramped for two. In any case, you might want to plan ahead and reserve a vehicle. 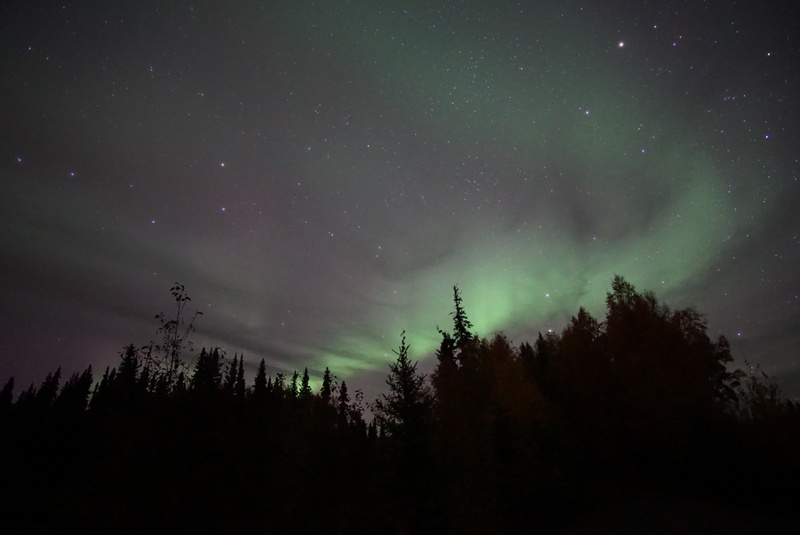 By far the brightest night, just outside Talkeetna. When you’re not looking for the aurora, you can look pretty much anywhere else for the kind of beauty you won’t see in the lower 48. Alaska is stupidly beautiful; it is like Colorado times two. The mountains are twice as big, the rivers twice as wide, and there are no fences anywhere. It is an open, wild, amazing place. 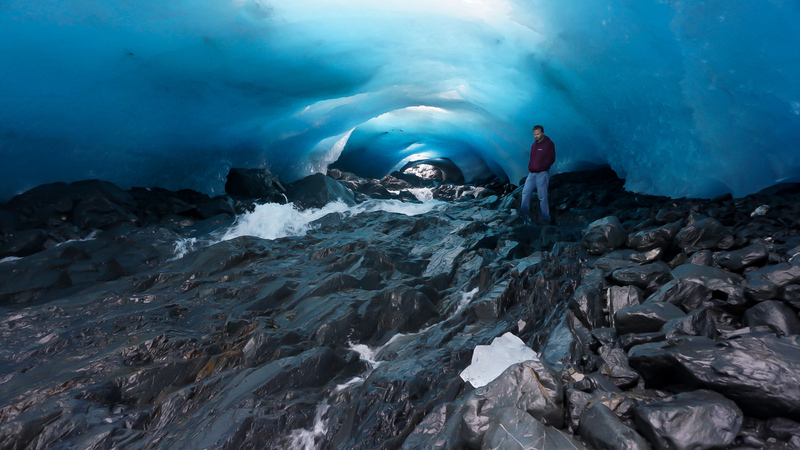 If you are up for a serious hike, I recommend hiking to a glacier. There are several, most of them have receded significantly in recent years so the hike is longer every year, but if you can make it, it is totally worth it. A few other things to see: Denali of course (plan ahead if you want a bus tour), Hatcher Pass, the town of Whittier (One lane tunnel in and out, everybody lives in one tower), Talkeetna (a little town at the convergence of huge rivers), Chena Hot Springs. I also recommend driving off the highways to find some small, out of the way towns up north. The rural north is a totally different place than anything south of Talkeetna. People are a little strange, but very friendly, and you get the feeling that you are definitely not in Kansas anymore. Also, bring a camera. You could give a disposable camera to a toddler and come away with enough beautiful photographs to fill a calendar.